Previous PostWhat is Spatial Channel Correlation?Next PostDoes Reciprocity-based Beamforming Break Down at Low SNR? How can I reproduce this graph? I am trying to determine the power consumption model, especially for the total power model. 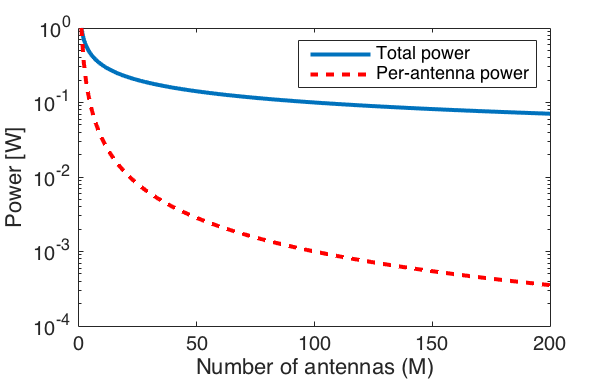 If you are looking for a detailed power consumption model, I can recommend my paper “Optimal Design of Energy-Efficient Multi-User MIMO Systems: Is Massive MIMO the Answer?”. Thanks, initially I included the consumption of the phase shifters and RF chains (neglected the impact of the base station). Since there is a trade off with array gain and circuit power consumption. Thanks for the recommended paper.